Feodor Chin is an actor and writer from San Francisco, CA. As an actor, he was classically trained at UCLA, the American Conservatory Theater, and has studied with renowned acting coach, Larry Moss. He graduated the Improv, Sketch, and Character programs at UCB LA and is a performer and writer on the iO West house sketch team, Wilton. He also produces and hosts The Golden Hour, a monthly sketch show at UCB that showcases Asian American talent. 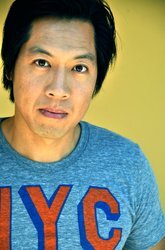 In addition to being the voice of Zenyatta in Overwatch, other voice credits include Mudmug in World of Warcraft: Mists of Pandaria, Splinter in Teenage Mutant Ninja Turtles: Out of the Shadows, Tran in Sleeping Dogs, Earl on Cartoon Network's Regular Show, and Evil Lord opposite Jackie Chan in the feature film Monkey King: Hero is Back. On camera credits include appearances on Lopez, New Girl, and The Bold and the Beautiful. He was a writer for the CBS Diversity Comedy Showcase and he has never met a braised meat he didn't like.